John Edmonds, 58, claims he has slain 18 of the ‘grays’ with a samurai sword. The owners of an Arizona ranch are desperately trying to sell the property where they claim they have been terrorized by aliens for the last 20 years. 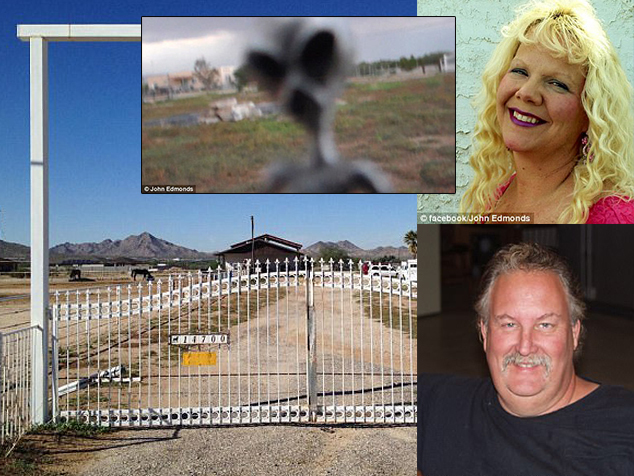 John Edmonds and his wife Joyce say the aliens, which they call ‘grays’, have been attacking them for years on the property in Buckeye, Arizona. John, 58, says he is left no choice but to slay them with one of many samurai swords he keeps around the house but claims their bodies vanish immediately afterwards, making it impossible for him to preserve them for research. They first put their home on the market 11 years ago for $1.1million but, after appearing on television shows about the extra-terrestrial and finding stardom on chatrooms and internet hubs devoted to aliens, they have raised the price by almost $4million. Now they want $5million for the 9.67 acre property. They believe there is a portal which links them to another universe on the property which the ‘grays’ travel through. Another of their theories is that a spaceship or UFO is buried beneath the property which was built in 1977. He says the aliens pop up at random, sometimes in groups, to attack him. Fifty-three-year-old Joyce says the mischievous creatures have even sexually molested her in her bedroom. The extra-terrestrial disturbance has not stopped them from running Hopeful Hooves, their horse-riding school for disabled children which they operate on-site, but the pair are now eager to move. They make no secret of their experience in a realtor.com listing for the property which even uses it as a selling point. ‘The current owners purchased the property 20 years ago to run a horse rescue. ‘Over the years, they have experienced a series of strange events that continue to this day,’ their realtor said. Bizarrely, they did not include photographs of the house’s interior on the listing. Over the last 20 years, Edmonds says he has killed 18 of the ‘grays’. He claims he has been mutilated by them and that some of the animals on the property have also suffered inexplicable injuries. When he and Joyce moved in 20 years ago, they were not told of any alien activity. Their first clue came on the first day in the home, all of the old owner’s furniture which had been left behind ended up in the pool. John claims to have sent some of the tissue and blood to independent labs to be tested. The couple previously appeared on Ghost Adventures on the Travel Channel.